What was looking like a wet and miserable start to the calendar year, we arrived at The Home of Jump Racing at a very early time of 7am. We started out on Talk Sport 2 interviewing owner Rich Ricci who discussed his recent shock defeat at Leopardstown where his horse Faugheen pulled up and how it was a real low moment for him. It was a great insight interview despite his obvious disappointment. Next on our agenda was our live broadcast on Cheltenham Radio and Rupert was joined by another member of our racing team Hayley Moore, to discuss and profile key runners and riders including Yanworth’s racing perspective who later went on to win the BetBright Dipper Novices’ Chase that day. As the day developed, we bumped into Mitsubishi Motors Badminton Horse Trials winner Andrew Nicholson who is looking forward to defending his title later on in the year as well as Olympic Dressage Champion Carl Hester. “It’s been an extraordinary build up this year’s Cheltenham Festival Trials Day so let’s hope this helps clear the muddy water”. Time for the annual fitness regime to kick in. Short break in Washington DC over, now comes two of the most testing weeks of the year – The Awards Circuit. We have ours on Monday – the Horserace Writers Derby Awards to be more precise, and the very next day an early plane beckons to the Horse Racing Ireland Awards, to which an invite is much prized. And, as if that is not enough, the very next day its back to the UK and to Gloucestershire for more ‘hospitality’ at the launch of the 2018 Randox Health Grand National – this at a yard which has had more cause for celebration (and by all accounts made the most of it) in recent weeks. Even then we’re not done as the following week it’s the Go Racing in Yorkshire Awards. We all have our own memories of 2017 and I won’t embarrass the guilty by naming mine for ‘Worst Transport Nightmare’ (though there is a runaway winner) or the ‘Worst Interviewee of the Year’ (in fairness a very small field), but here are a few of my 2017 highlights which will stick in what’s left of my brain long beyond the Big Ben chimes of midnight. No question. Winner: Sir Mark Prescott. 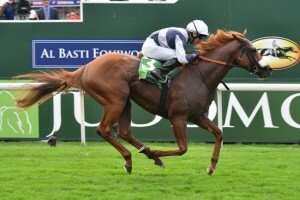 Good enough to speak to me about the chances of his brilliant filly Marsha before she went to the Breeders Cup – the first time Sir Mark was planning to race there himself. Tough, but probably seeing Jessica Harrington, for whom my respect is only matched by my admiration in the winners enclosure after Sizing John’s Gold Cup win at Cheltenham. At the age of 70 she had struck gold with her first runner in the Blue Riband. And for some years – Many Clouds, brave and courageous to the end at Cheltenham. Enough said. Jockey James Doyle is one of the most personable, helpful and articulate of all the flat jockeys, to such an extent that he emerged before racing at Royal Ascot one day to do an interview for ITV at the entrance to the weighing room clad in a top and with his bottom half covered in a well fitting towel, which he was holding in place while doing the interview. The ‘opportunity’ this presented was seized by the Jockeys Room mischief department who got to the scene seconds too late. One more question to that nice Mr Doyle and things would have got, shall we say, interesting. The next generation always take their time to adjust to media demands, that’s understandable, but in more years than I care to admit doing this job few have proved a better interviewee than teenager Harry Cobden. Sensible and mature way beyond his years he made a great impression and he’s shaping as a rider with the potential to go to the top. Here’s the contentious bit – to paraphrase the great Bill Shankly – ‘to some punting is a matter of life and death, to us it’s much more serious’. Of all those that go racing or watch it, how many really care about ante post, spreads, exchanges, sectional timing and the like? The answer is a minority, but a very loud one if you believe the amount of coverage given to those rather than to the sporting interests of the majority. People talk through their wallets and not their heads, and to me it is just plain wrong. So here endeth 2017 and if you don’t hear from me for a while I hope you will understand why! So here endeth the 2017 Flat Season, even though they race on turf for another fortnight and this weekend could see history made with an unprecedented 26th Group One win of the year for Maestro O’Brien, who has taken this training game to new heights. But there’s still some work to do. I sit on a couple of voting panels one of which will choose Racehorse of the Year- surely Enable after her glorious conquest of Three Oaks and the French in a never to be forgotten demolition job in the Arc at Chantilly. And after a summer in which the Weather Gods ran as badly as some of the best backed horses, perhaps an award for the worst ‘soaking while covering racing’ of 2017. It’s an award with a long and distuinguished short list, even though, I am happy to report, despite the gloomy forebodings from the usual suspects last Saturday when Storm Brian was due to at Ascot he appears not to have booked a ticket so it does not qualify. But there are plenty of days that do. 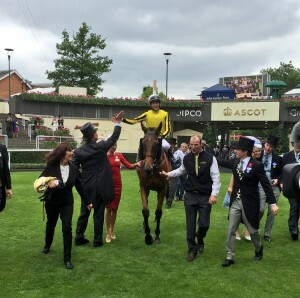 Ascot gets on the list for the spectacular cloudburst on King George Day in July, the night after York on a music night when ‘Wet Wet Wet’ would have felt at home. 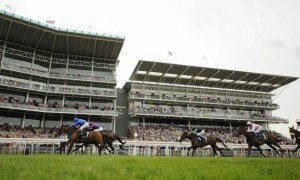 Then there was the first day of the Ebor Festival at York. The train is admirable- 2 hours from London- but waiting for a platform outside York station that Wednesday morning the sky got darker and darker and darker. In 2 hours the rainfall count was of cricket score proportions. But no, dear Reader, that doesn’t get the prize. It goes to Sussex Stakes day at Goodwood. The leafy Sussex Downs are truly glorious on a fine summers day but on that memorable Wednesday it got wetter and wetter and wetter. No one would have argued if the racing had been called off because of the waterlogged state of the crowd. It’s not all glamour in this job you know! I couldn’t wait to start working for Lloyd Bell Productions this summer; I was so excited to work with all the different clients and events. Now I am leaving, I am truly sad to go as I have enjoyed every part of work over the summer! Throughout the summer I have had the opportunity to work on loads of events from the Athletics World Championships in London to Goodwood Festival horse racing. My personal highlight though has to be attending Burghley and Gatcombe Horse Trials. I have always dreamt of attending both events however have never been able to go, but this year it all changed as I finally went to the event but not just to watch, I managed to meet some of the top riders in British and world eventing. I love Equestrian sport and have been lucky to work on plenty of horsey events over the summer but I have also enjoyed working on other events which I would have never experienced without Lloyd Bell Productions. Athletics events were a big feature of the summer and if I am truthful, I did not watch athletics in the past but as the summer continued I found myself watching more and more athletics and will definitely keep up with it in the future. One day I hope to start running my own events and my time here has given me plenty of new skills, knowledge and experience which I hope to use in the future. I have thoroughly enjoyed my summer working for Lloyd Bell and while I don’t want to leave, I am also looking forward to starting my next chapter in Aspen Colorado! There’s one thing that stands out about this job- variety and the need to deal with all sorts of emotions. Then came 4 days of the Welcome to Yorkshire Ebor Festival. Four magical days in Gods Own County where the horses who stole the show were Ulysses, Enable (our best of the year) and Marsha but the first day welcome was one of the most spectacular if happily short lived cloudbursts I have ever seen. York is famous for the successes of its summer music programme but it really did seem Wet Wet Wet had made an unscheduled appearance. There have been trips to Ireland in between- notably for the first day of the Longines Irish Champions weekend, but in recent days two tasks that really made you realise why racing is more than just a sport to countless thousands. It was back to York on Sunday for a day which featured the first running of the Tom O’Ryan Apprentice Handicap, named in memory of the man who was my Presentation colleague at York in 2016 until he was stricken in late July which claimed his life just five short weeks later. How Tom would have loved that the race was for Apprentices. He mentored many, who sought him out as his advice was solid gold- just as his friendship was to people like me. Yorkshire was his adopted home and he would have been thrilled that a young man named Callum Rodriguez, who spoke with a sincerity and dignity of how everyone had talked about Tom that did him enormous credit, should have won the race. Just 24 hours later I found myself interviewing jockey George Baker. A year ago he celebrated his finest hour when he rode the winner of the world’s oldest classic, the St Leger, at Doncaster on Harbour Law, the first victory in a race first run in 1776 for a woman trainer. This weekend he will be back on Town Moor, just pleased to be there after life threatening injuries in the most horrific fall at St Moritz where horses race on ice. He talked amazingly about how watching that Leger DVD has helped so much in his recovery and in a 3 minute interview used the word positive no less than 5 times. There have been few more popular jockeys in the flat racing world in the past decade. His courage does him huge credit. It was, of course, Bill Shankly who once said ‘Football to many is a matter of life and death- to us it is much more serious’. What a shame no one in racing has ever encapsulated what the sport means in such memorable prose.